Beautiful engraved Gold Bond Specimen Certificate from the National Limestone Company dated in 1910. 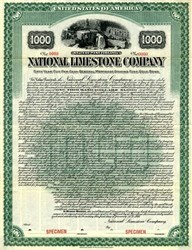 This historic document was printed by American Bank Note Company and has an ornate border around it with a vignette of the National Limestone Quarry. This item is over 97 years old. 100 coupons attached on top. 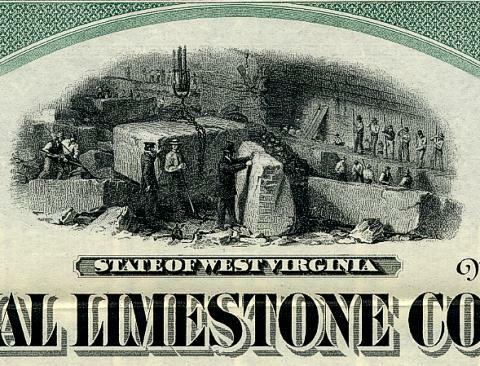 Buy In a Big Limestone Plant Martinsburg, W. Va., Oct. 13.�The big plant of the National Limestone company WM sold here under a decree of the United States district jourt to the reorganisation committee �f the company. The price was $200,- JOO, two-thirds of the appraised value of the property. After the sale had been.ratified by the court tie plant will be re-opened. What Are You Earning?